For students entering colleges and universities for the first time, earning a degree requires tools that didn’t exist a decade ago—and cloud computing is one of the new tools students and their instructors are using. 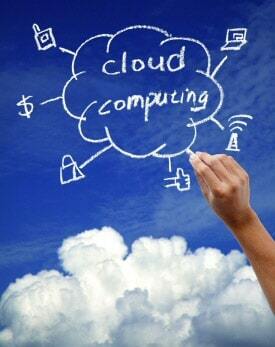 But cloud computing can do more than let users exchange data—they can also use it to collaborate and exchange ideas. Cloud computing isn’t exactly new, although companies like Apple and Amazon are marketing their cloud services to the general public. Many colleges and universities have used the cloud as a component of their learning management systems, web-based platforms used by schools to post course content and store data. Learning management systems allow instructors to post syllabi, assignments and course announcements—they also sometimes feature message boards and chat rooms where instructors can lead online class discussions and communicate with students one-on-one. For students working toward an online degree, learning management systems can serve as a home base where they receive information about their courses, instructors and classmates. But cloud computing in higher education isn’t always confined to university-run platforms. Many instructors are using cloud services like Dropbox and Google Docs to work on group projects, share research and keep copies of papers or another assignments. The ability to access data from anywhere can be especially important when students graduate and begin building online portfolios and resumes. Students who learn to use cloud computing in high school and college are also preparing themselves to use that technology in their careers. As the workplace relies more heavily on the Internet to complete tasks and communicate, cloud computing can be a secure way for businesses to become more efficient: offices can store client files and other information on a private cloud, which can save money and physical space. Learning the benefits and the drawbacks of cloud computing can be an asset for workers; helping their companies transition from a paper-based system to an online platform is becoming a valuable skill. But knowing how to use cloud computing is just part of the value: knowing how to collaborate in a cloud-based environment can be useful as well. By giving workers the ability to share information instantly, to communicate with each other at any time about data or files, and to meet online regardless of physical location, teams can work more efficiently and creatively. One of the goals of a college education is to prepare students for careers, and with the speed at which technology advances, students who use it in their everyday lives will have an advantage over their job market competition. Cloud computing is poised to change the way we store and exchange data, but it’s also changing the way we teach, learn and work. With the Internet as an essential part of our lives, people who learn to use cloud computing are leading the way into a digital future. Lindsey Harper Mac is a writer and editor in the Midwest working on her Master’s Degree. Lindsey Harper Mac is a writer and editor in the Midwest working on her Master's Degree. Cloud computing is more convenient for many institutions and organizations nowadays, and people no longer have to depend on bringing with them portable storage devices like USBs, CDs, external hard drives just to save and retrieve data. It also is an assurance that your data is safe when there are natural disasters occurring. If your data is on the cloud, then your data is safe even if your computer is destroyed from tornadoes, floods, etc. USBs and CDs are still used. I guess cloud computing is made beacause of the advancements in mobile technology. Since mobile phones/tablets can now connect through the world wide web, and most of these gadgets doesn’t have USB sockets, the cloud was made. I can’t remember the last time I used a USB or CD though. Cloud computing is so handy and effective, that most people take it for granted (because entry-level cloud computing services are offered for free). Thanks for sharing the advantages of cloud computing!